A great cafe for breakfast and brunch. In many ways, Hawaii is the odd one out of all the states in the US. It's an island paradise that's been made part of an industrialized nation. The climate is different. The names - streets, towns, villages and mountains - are different. While the south shore of Oahu is a cross between Miami and maybe Las Vegas with all the hotels in Waikiki, I think the person who said that the north shore is like Guatemala more or less called it. ...and one very good café. 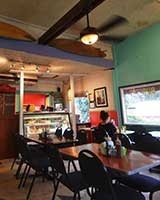 Café Haleiwa is a 40 minute drive from Honolulu, and it is well worth it. The food and service is excellent. While there may sometimes be a waiting list to get in, it is worth a short wait of five to ten minutes. Just get your name on the list and you'll be in the café in no time. I've had breakfast here twice, and it's been great both times. As you can see, I went whole hog for the omelette with rice and toast, and a side of pancakes and coffee and some liquid that I can't remember what it was. It tasted great anyway. That I'm pretty sure of.